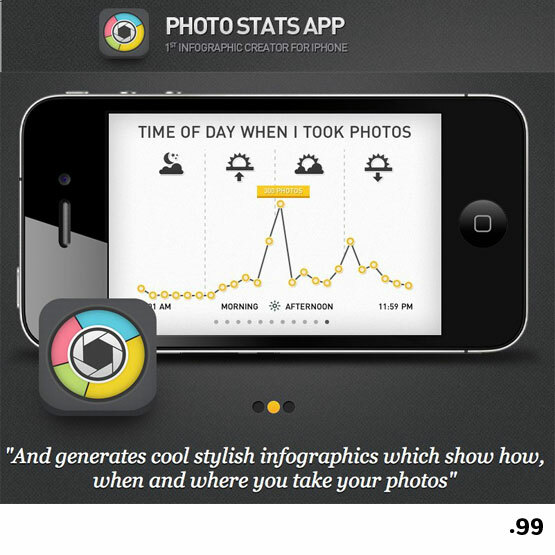 Monthly App Review: Photo Stats App will make your iPhone Photo-Life in to an Infographic! The business world of app development is huge. With so many tools at our fingertips, I am constantly discovering new apps. Be it for iPhone, iPad, iTouch, Android, Blackberry and so on, I'm sure you're all like me when find I would be lost without some of my favorites. I'll be researching and picking (at random) an app I feel is worth mentioning each month. This month's selection is by Dear Future Astronaut AB and a bunch of fun so far. What initially caught my eye was their color-wheel style logo. I love the colors and layout of the finished infographic too! Very clean and fun to look at. Kudo's to the developers! PHOTO STATS APP - 1st Infographic Creator for iPhone. If you use your phone to take a lot of your point-and-shoot photos, and you really like to take photos, this is definitely for you! I've recently been playing around with it and it's pretty fun! At a base, .99 - totally worth the fun. Now I want to go traveling so that I can make this more interesting! All the little details are super fun to check out. Top Cities, Image Count, Memory Taken, ISO, Shutter Speed, Flash Time of Day... Amazing! I'm currently using the iPhone 3Gs and holding out for iPhone 5 (tap tap tap)... I can't wait to do this with my new phone. Now I want to remove all my current photos and literally consciously try out some sort of method to create a cool infographic for myself. If you decide to try it out, share your infographic in the comments! @ifollowtherabbit yeah I thought it was pretty fun. they posted on our Facebook wall today saying thanks and that they will have a big update coming out soon for further customization. I can't wait!